Rite Envelope & Graphics, Inc. is home to the largest custom business envelopes selection in the Philadelphia, New York, Baltimore, and Washington areas, with many specifications to choose from to suit your company’s evolving needs. When your business decides to go with Rite Envelope & Graphics, Inc.’s custom business envelopes, we guarantee our products will leave a lasting impression every time. Choose window envelopes in a variety of sizes to conveniently mail invoices, bills, and statements, or a more durable clasp envelope that is tear- and rip-resistant for utmost security. Rite Envelope & Graphics, Inc. is also a proud “Go Green” supporter and recycles all paper, boxes, and printing plates after use. Do You Need Custom Printed Business Envelopes? Rite Envelope & Graphics, Inc. is your answer for completely personalized packaging for all of your most critical documents. We are a commercial print envelope manufacturing company that specializes in custom printed business envelopes, brochures, and more. …And all other regions throughout the United States. When you are looking to add a distinguishing element to the packaging of your mail, Rite Envelope & Graphics, Inc. has the resources to craft your custom printed business envelopes exactly to your specifications. Stock manufactured envelopes cover certain industry-specific requirements, but they do not include business-to-business diversity, let alone project-to-project designs. Due to the massive scale on which they are replicated, stock envelopes bought in bulk will always come with a few variances. These small mistakes add up and can be more than just an inconvenience when you need every envelope for a client or guest. Stock envelopes, which are produced in the millions and packaged in a warehouse to be stored until sold, come in standard sizes with very little room for modification. They typically only come in specific sizes and colors. Custom envelopes, on the other hand, can be made according to a project, special event, or other cause because they are not created with multiple buyers in mind. Our custom printed business envelopes are tailored or made from scratch for each of our customers. Buy Printed Business Envelopes with Rite Envelope & Graphics, Inc. Today! With Rite Envelope & Graphics, Inc. you can even buy printed business envelopes that have been converted from rolls of paper; this is a perfect choice in the case of companies that have their own parchment for letters and want an envelope with their logo to match. 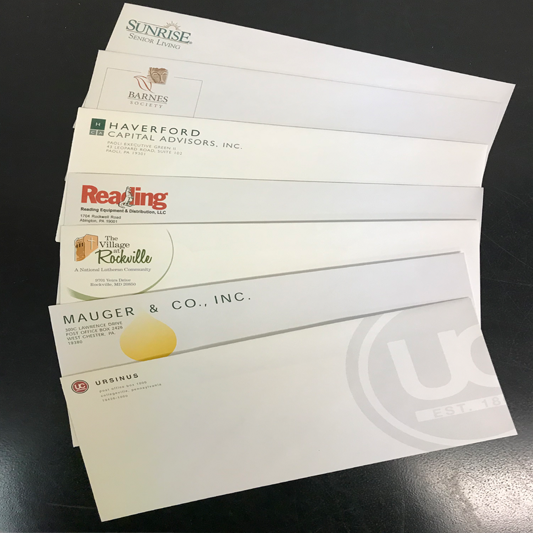 Some of the common customizations our clients have ordered for their custom-printed business envelopes include full-color, interior tinting, unique measurements, and multiple die-cut windows. From official corporate announcements to save-the-dates and more, our custom business envelopes are the perfect way to put your best foot forward. Calling 610-981-2373 will put you in direct contact with one of our staff who can answer any questions you may have about ordering, customizing, pricing, and shipping. Interested parties can order online or by phone today.